3 posts categorized "Daft Punk"
Daft Punk + Pharrell = YUM. 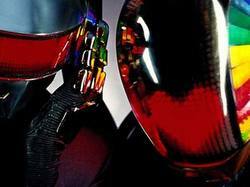 If you are familiar with Daft Punk, specifically their song Harder, Better, Faster, Stronger, then you will LOVE this site. Access THIS LINK and get to tapping. This is hot. Have fun. xo. 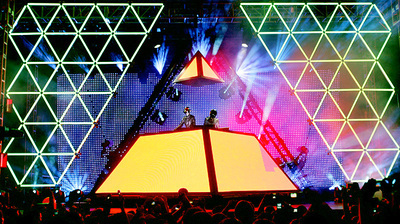 Last night I was treated to an amazing show - Daft Punk @ Keyspan Park in Coney Island, New York. One of my nearest and dearest friends, Dan, got us both tickets to the sold out show - and what a show it was! I've never been to a show at the Keyspan Park. For those who don't know, Keyspan Park, home of the Cyclones, is a baseball park out sitting directly beside the famous Coney Island boardwalk. Coney Island is like no other place - part amusement park, part freak show, part ??? - it's tough to describe. That is the beauty of that place. The show was brilliant. The music was some of the best thumping dance grooves that I have heard in a very long time. I used to get out dancing on a nightly weekly basis when I first moved to NYC. Dan and I would make our way to Splash or Roxy or one of those gay dance staples and wiggle our hinies. We got to do that again last night along with thousands of other New Yorkers. It makes me really want to get out and about again soon. Our friends Summer and Jeff were also along for the ride and it was truly beautiful. Anyone who is still dismissing house and electronic as soulless and lacking emotion has not seen a Daft Punk show. These guys are masters at what they do and the crowd is completely in to it. Below are two clips - not from last nights show though - of Daft Punk live. It had been a very very long 10 years since these French musician/DJs went on the road and it was well worth the wait. Thanks Dan - Love You. xoxo.